Update (6/6/17): Gov. Brownback has vetoed the bill. We also corrected the vote total in the House below; it was 69 to 52, not 69 to 32. We’ll update this post if a veto override attempt occurs. Update (6/7/17): S.B. 30 is now law after the Kansas House voted 88 to 31 and the Kansas Senate voted 27 to 13 to override Governor Brownback’s veto. Raise individual income taxes by creating a third bracket of the individual income tax for income above $30,000 (single) and $60,000 (married filing jointly), with the rate set at 5.2 percent in 2017 and 5.7 percent in 2018 (compared to the current 4.6 percent). The bottom two income tax brackets of 2.7 percent and 4.6 percent would go to 2.9 percent and 4.9 percent respectively in 2017, and 3.1 percent and 5.25 percent respectively in 2018 and thereafter. Repeal the pass-through carveout (complete income tax exemption for Schedule C, E, and F income) retroactive to January 1, 2017. Kansas is the only state in the country with such a provision. Reenact the itemized deductions for mortgage interest, property taxes paid, and medical expenses, at 50 percent of the federal amount in 2018, 75 percent in 2019, and 100 percent in 2020 and thereafter. Reenact a child care tax credit at 12.5 percent of the federal amount in 2018, 18.75 percent in 2019, and 25 percent in 2020. Reduce the low-income exclusion level from $5,000 to $2,500 (single) and $12,500 to $5,000 (married filing jointly). The state Department of Revenue projects an $889 million gap between revenue and spending in the current and upcoming fiscal years. 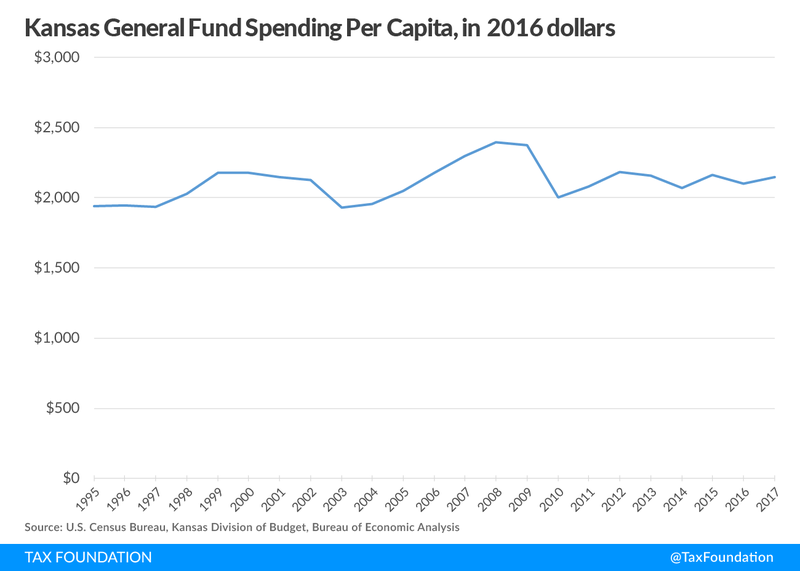 Additionally, in March the Kansas Supreme Court ordered legislators to increase school funding by June 30, concluding that $4 billion in state aid to local school districts is inadequate. State aid to schools reached a high of $4,433 per pupil in 2009, but fell to $3,780 per pupil in 2012. Brownback had earlier proposed $400 million in new revenue, from raising cigarette and alcohol taxes and a one-time securitization of future tobacco settlement revenue (in essence converting $58 million in annual revenue into one-time cash), and halting two-thirds of road projects until 2020, measures that legislators rejected. S.B. 30 is estimated to increase tax collections by approximately $600 million per year. The income tax rates would be higher than they are now, but lower than they were in 2012 (see table). Legislators also voted yesterday to boost school funding by $293 million over two years, bringing the per-pupil level to $4,006; the vote on that was 23 to 17 in the Senate and 67 to 55 in the House. Legislators had earlier rejected a combined tax and school funding bill. Governor Brownback has not said whether he’ll sign or veto the school funding bill. Note: Bracket amounts for married filing jointly are doubled. We have been a voice for retaining some or all of the broad-based income tax reductions Kansas has enacted, while we have been very critical of the pass-through exclusion for creating a distortionary tax carveout. Contrary to Kansas, the tax reform approach taken by other states such as North Carolina and Indiana have focused on eliminating special carveouts rather than adding new ones, and building tax reductions into budget baselines. Coming up with a solution is not easy and may set a record: yesterday marked 108 days into Kansas’s traditionally 90-day session; the all-time record was 114 days in 2015.